We’re three games into the Premier League campaign and it’s still far too early to make any confident predictions but what interesting statistics have emerged so far? New boys, Huddersfield lead the tackle count with 69. It looks like David Wagner has continued with the aggressive pressing style that served him so well in the Championship. In second place is another fan of the Gegenpress, Jurgen Klopp, whose Liverpool side sit on 63. Interestingly, the interception count is headed by two Ajax old boys. Dutch managers de Boer (Palace 62) and Koeman (Everton 51) are way ahead of the pack. Is this a coincidence or a sign of something more fundamental? Ex-Dortmund men pressurising the man, ex-Ajax men controlling the space? It will be interesting to see how this develops, if de Boer can stay in a job long enough. Possession is headed by the usual suspects – Guardiola’s City, Pochettino’s Spurs and Wenger’s Arsenal. Tony Pulis is working his own unique brand of magic, sitting bottom with a measly 38.6% despite taking 7 points from 9. A quick look at the key passes table shows a couple of players taking up expected places in the top three – Mesut Ozil and David Silva, tied on 12. However, out on his own on 13, Henrik Mkhitaryan leads the league; testament to an impressive start for the Armenian. When it comes to taking on players, Oxlade-Chamberlain is currently the most prolific. He tops the total dribbles (21) and successful dribbles (17). Maybe that explains why Chelsea and Liverpool were fighting over his signature. Harry Kane’s August struggles have been well documented, so it is a bit of a surprise to see the Spurs’ striker top the division for shots, with 24. The gap to the next best player, Romelu Lukaku, is an eye-opening 10. If Kane continues to get chances at that rate, he and Tottenham should see the goals and results fall into place. I ran simulations of the shots taken in each game using a simple shots model. 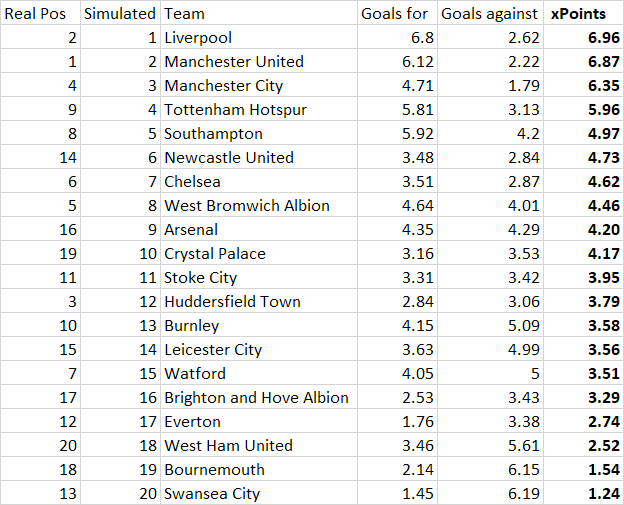 Here is the table based on those simulations. As shots are far more numerous than goals, it should give a better idea of how teams are doing at this early stage – although three games is still far too soon to make any bold predictions. It’s been a good start for Liverpool and Manchester United, who make the early running after productive transfer windows. Spurs look a little unfortunate to be down in ninth after conceding two late goals. On this evidence, maybe the Palace board should give de Boer a bit more time. Everton, many pundits dark horses, have been disappointing but their results are skewed having faced Manchester City and Chelsea. Brighton would expect to be struggling as they find their feet at this level, but Swansea, Bournemouth and West Ham must be a little worried at their form so far. This entry was posted in Statistics and tagged football, Premier League, Statistics on August 30, 2017 by Jon @ AnythingButPenalties. For the second consecutive time, Spurs’ concentration has waned towards the end of the game. I attribute this to mental weakness. A one-goal lead leaves you in a precarious situation and yet we failed to capitalise on the many scoring chances we had which simply means we are not clinical enough. In addition, Pochettino’s late substitution did not help matters. It was not necessary at this late stage as we were well in control of the game and we could have held on to our narrow lead. It only upset the rhythm of the game for us creating many openings which Burnley exploited very well enabling them to clinch the equaliser in the dying minutes. It was a very disappointing result for all the fans and not all that good a start to the season. It was very frustrating. Points dropped in August have cost us dearly the last two years.